One thing I’m good at is inflating my hopes. Exaggerating my parameters. Building my weight-bearing circus-tents out of balsa wood. The following is the piece I had been referring to for some time. I truly thought it was going to make the cut in the publication for which it was solicited. It did not. So now, I foist it upon you for free. Perhaps the greatest irony in my discovery of Tenkara’s quiet minimalism the fact that I was engaged in the base activity of paralyzing my Hippocampus with an Ipad when I found it. Somewhere in the midst of all the pop-ups, synaptic bellicosities, and rank endorphin addictions lay this quiet meadow–and veritable dream for the Walden Pond deconstructionist. 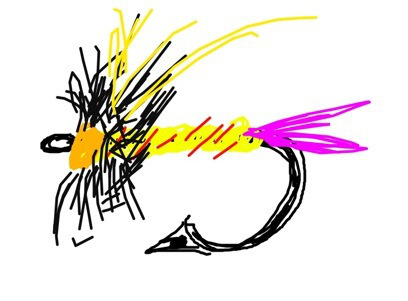 The mind screamed; I can fish while tossing all my gear into the ether. I can finally concentrate on things that actually drew me to fly-fishing in the first place. My life as a guitarist has made no fewer leaps. At one time, my effects rack consisted of every digital delay, distortion, reverb, chorus and harmonizer I could bolt into it. I became so enthralled at the technical maelstrom within the course of making music, that I forgot about making it at all; I was more concerned about air-brushing my Stratocaster with a cloud-shadowed moonrise than causing a foot to tap. Process over mission. While skulking down road to minimalism, the tackle box genuflected to the fly box. The effects rack abdicated to an effects pedal. This went on until my acoustic guitar had my workhorse electric in some sort of an operational full-Nelson for quite some time. I began to discover that that my time spent in the halls of minimalism gave me a whole new outlook and approach to the times when minimalism wasn’t an option. It made more extravigant pursuits far more economically-constructed. And far more intergral at the core. So the night I saw Tenkara demonstrated on a YouTube video, the implicatory effects had the same exonerating feel that driving on the open plains does for a cerebral claustrophobic. It was all I could think about for days. Something about lowering the equipment ratio and raising the standard at the same time appealed to me. Within three weeks, I had purchased and landed a fish on a 7:3 Yamame. For lack of a better term, I was hooked. It was ironically a YouTube clip of virtuoso James Hill playing three simultaneous counterparts of Michael Jackson’s Bille Jean on a Ukulele that had me heading out to peep one of those as well; I was developing a healthy need to toss the extraneous Flotsam and Jetsam for a while. And oddly enough, this musician/fly-fisherman has made exponential improvement leaps in both areas, precisely attributable to falling into the Grand Valhalla of Having Less to Deal With; Complexity within simplicity, as opposed to complexity hacked out of clutter. I can live with that. 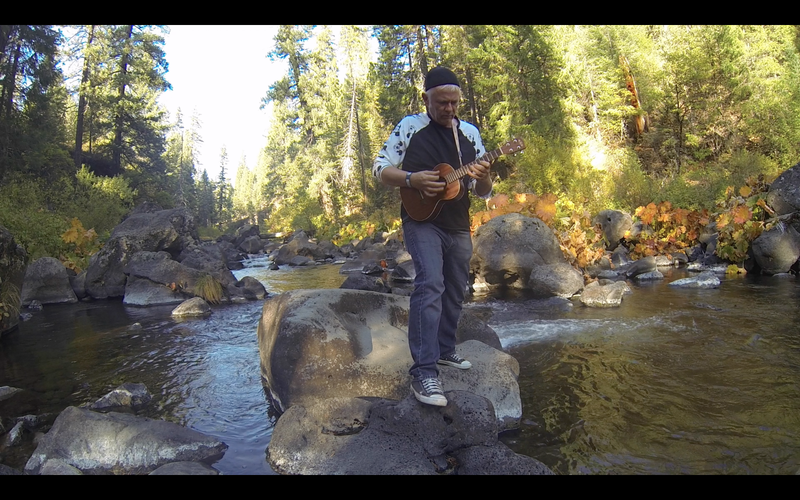 The ukulele is the first instrument I’ve ever actually taken to the river with me that seems to have any organic existence at the outset. I will actually sit on a rock and actually play actual music with it. It fits. It fits with the ambient water, it fits with the ambient light, and it fits with the ambient space implied in what logisitcal red tape was not required to get it to the water in the first place. And now, looking backwards, my silly little penchant for Cliff’s Notes, retrograde analysis kicks in; they have nearly everything in common–aside from the odd coincidence that both arenas brag as their greatest exponents–masters of Japanese heritage. If you place your finger on Middle C on a piano, and count 14 white keys to the right—and stop there—you have defined the entire sonic spectrum of a Tenor ukulele. That kind of redaction can be scary—especially to those who depend on a broader spectrum. Yet, Jake Shimabukuro has managed to scorch out a commensurate version of Queen’s Bohemian Rhapsody at a TED conference without batting an eye. Once the possibility of complexity is seen to remain extant, a sense of possibility sets in quickly. Hitting the water for the first time with an Iwana rod, eleven feet of line, some 5x tippet, and an odd, reverse-hackle fly feels . . . shall we say, limited. The saturation contrast alone will invoke inaccurate reflexes that call into question whether or not Tenkara fishing is nothing more than a gratifying way to fling line at the water. It never does seem to set in, however, that the 14th Century woodcuts from the Izaak Walton tome portays something eerily similar. He thought this fixed-line approach most swell enough to write a book about it. Maybe we should read it. Maybe we should start hitting the grassed-over berms on the old back roads, instead of constantly trying to be the guy surfing the whitecaps of engineered obsolescence. And besides. A procedural wreck at the corner of Galhardo and Ishigaki leaves far less damage. I’m still reeling from an adolescent trauma involving monofilament backlash and a button-fed Zebco fiasco. I’m not going back. Level line, please. Take your Iwana rod out of its case at your local fly shop, and a swirling, shaudenfreude vortex will open in the ceiling. The simultaneous intrigue and revulsion that accompanies the unknown is sometimes entertaining. I met this first hand when my fly-shop buddy yanked my Man Card ten seconds after I unsheathed the sans-reel, telescoping threat-to-testosterone-levels. Tiny Tim did more to galvanize the ukulele into some tragi-comic third dimension than the instrument’s diminutive characteristics ever could have by themselves. But no matter the reasons, I routinely find myself in the ambassador’s seat more often than not when I uncase either one of these items. Over time, I’ve just learned to enjoy the conversational points-of-departure and call it day. I’m catching fish. I’m playing things on my uke that turns heads. Perhaps the greatest part about such minimal baselines isn’t just about what one has been able to shed, but basking in the joy of the spaces left behind. I never before thought of fishing or music as having an applicable Feng Sui subtext to them, but they do. I’m not the guy to extrapolate some broad, metaphysical doctrine at this level, but the beauty of any song is only partly contingent on notes. The real crux of its DNA deals with the space between those notes. Sometimes, an extra note is too much, causing tension. Too distracting. Dissonant. Or, more to the lexicon, diatonically incongruent. Sure, Flight of the Bumblebee is cool. Try to settle one’s mind around a soundtrack containing an endless loop of said Moto Perpetuo, however, and the measurable leap from obscure music lover to a machete-weilding, aerial CNN aberration is a very small . . . um, space. Tenkara is about space. Space between arrival at the river and quiet contemplation. Space between the active observation of fauana and flora. Space between the positioning of self and the deployment of line and rod and . . . casting. Space between fish. These are the notes in the song: Rivers, runs, rifles, hatches and the like. We can choose to oversaturate, composing a dense, overwrought symphony of our time on the water. if you see me, you’ll see me slowing the tempo down. Breathing between measures. pausing between casts. And perhaps sitting on a rock, playing my uke while the water rests. This entry was posted in Blogging, Fly Tying, Music, Tenkara, Ukulele, Uncategorized and tagged Blogging Advice, fly, fly fishing, Guitar, Jake Shimabukuro, James Hill, kebari, McCloud River, Tenkara. Bookmark the permalink. Ron, when will you publish? Chat at your Marin friends to get your work out there. You may be HOOKED, but you also ROCK! Much appreciated. One day, it will hit the bullseye! When less really is more….